I wonder now why for instance when we press the − key on our numpad a hyphen-minus (Unicode character U+002D and HTML symbol &#45) gets displayed rather than the “correct” minus sign (Unicode character U+2212 and HTML symbol &minus;). Is there any technical reason for this behavior – as @CAI mentions in his answer about the correct minus sign – or a is this only because of historical reason? Historical reasons only – plus a side dish of "backward compatibility". Since lots of computers were used for administrative purposes only, the calculator-like keypad addition appeared later on. 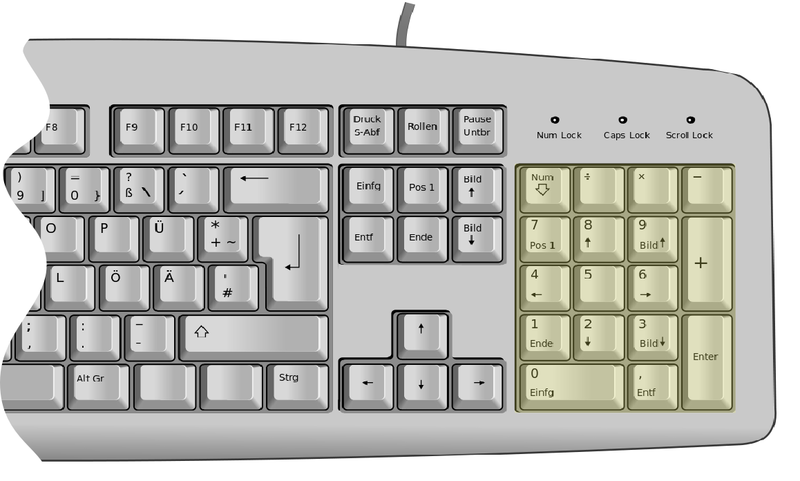 Initially it doubled for use with the arrow, page up/down, and home/end keys; later on, these in turn appeared as extra extra keys. The labeling on the keypad keys duplicated those of calculators at that time, but the character they typed had to be the same as the original ones used, for compatibility with existing software and for keyboards without the extra keys. The key caps reflect what the keys insert into programs to do the function they describe. It’s quite similar to pressing a key labelled "Backspace" and expecting that literal text to turn up. I know of no software at all that allows to use the Unicode character × for multiplication. The same goes for the Unicode characters Mathematical Minus and Divide (come to think of it, neither do other function/characters such as the Square glyph "2" – entering "52" into a calculator does not make it show "25" – and the Square Root character). It’s not the only peculiarity of standard keyboards. Most have All Caps letters printed on the keys, but all of the computers I know start up in lowercase mode, and it takes an extra key (Shift) or software mode (Caps Lock) to actually enter uppercase characters. Not the answer you're looking for? Browse other questions tagged history hardware character or ask your own question. What’s the right character for a minus sign? What are the origins of the commercial minus sign (⁒)?